I love candy, but it is safe to say most store-bought candy does not meet the kitchen test. In fact, if you read the labels, commercial candy is fairly terrifying. High fructose corn syrup, gums, chemical binders, emulsifiers, artificial colors, artificial flavors, and artificial sweeteners are just a handful of the very scary things you will see on the ingredient list for your typical commercially prepared candy. Yuck! Sadly, friends, I am a candy lover. Nothing makes me happier than a well made praline or a peanut butter cup with a snappy chocolate shell. I was once like most Americans, I ate the candy that was mass-produced by the big food producers not knowing it was engineered to hit my ‘bliss point’, or that it was loaded with all sorts of questionable – and downright bad – ingredients. These days I know better, but I still like my sweet treats. So, what is a candy lover like me to do? Candy is certainly a treat in my house, meaning I do not eat it every day. When I do indulge I want the candy to be as good as possible. The best solution for me is to make my own candy at home. It is easy, fun, and guarantees a candy made just the way I want it. During the holidays, for example, I make a variety of candy such as caramel cups, flavored marshmallows, pralines (pecan and salted peanut are the most popular), bittersweet chocolate truffles, fruit and nut bark, and fudge. The best part of making your own candy is you control EVERYTHING that goes into it, and it makes a fun activity that the whole family can get into! Use as little sweetener as possible, and make it as natural as possible. I try to use honey or maple syrup in my candy recipes when possible. When I do have to use granulated sugar I use fair trade organic evaporate cane juice sugar. Use fair trade, organic dark chocolate. Unsweetened and extra dark are best so please READ THE LABEL! Andrew has an excellent primer on chocolate here. Include nuts, seeds, oats, or dry fruits when practical to add nutrition and flavor. Toasting oats and nuts also add extra flavor. I bet you want an example of my homemade candy indulgences. Well, the candy I give you today is a favorite of mine. 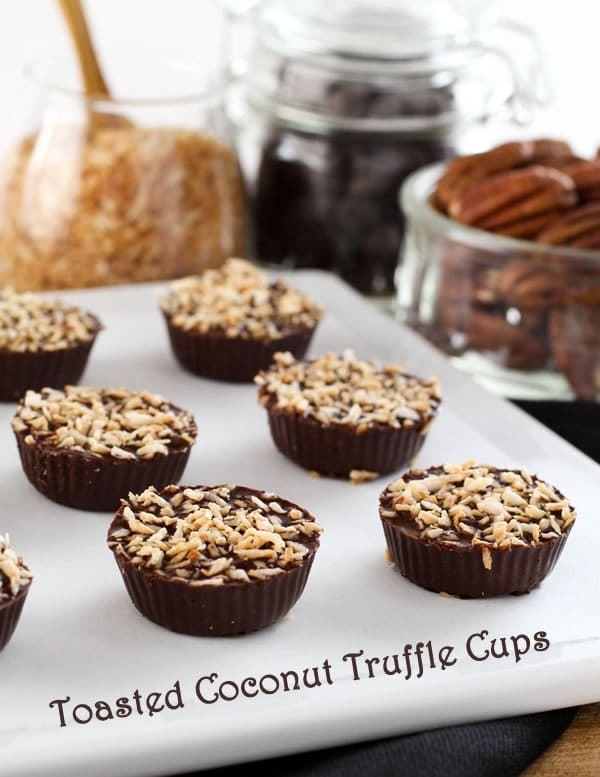 It is a toasted coconut truffle shaped into a little cup. It is cute, bite-sized, and loaded with flavor! 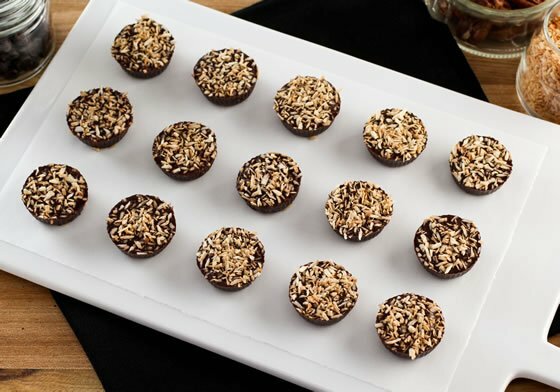 There are two ingredients hiding in these truffles that you would not know were present unless you were told – toasted whole grain oats and pecans. First is oats, which are used as a binder; they help thicken things up, and because they are toasted they add richness to the truffle cups. The other is pecans that are also toasted and then blitzed into a smooth paste with the honey (or maple syrup if you are vegan) into pecan butter. Aside from the flavor it adds, it also makes the truffles rich and silky. If you prefer you can make these with almonds, walnuts, or peanuts rather than the pecans. It’s all good! If you want a more traditional truffle just chill the mixture for a few hours in the bowl, then scoop into balls and roll in cocoa powder and more toasted coconut. I like the cup shape, but remember to keep these chilled as they get quite soft at room temperature. Well, the candy I give you today is a favorite of mine. 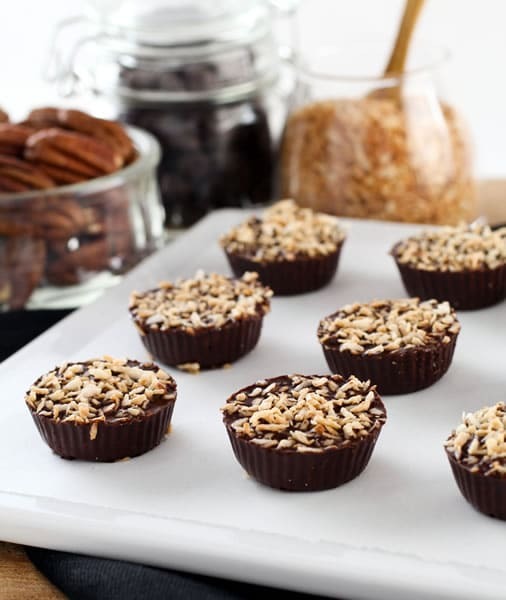 It is a toasted coconut truffle shaped into a little cup. It is cute, bite-sized, and loaded with flavor! In a skillet over medium heat add the oats and cook, stirring constantly, until lightly toasted, about 5 minutes. Transfer the oats to the work bowl of a food processor or blender and blend until the mixture forms a fine powder, about 3 minutes. Pour the mixture through a strainer into the work bowl of a stand mixer. In the same skillet over medium heat and add the pecans. Cook, stirring constantly, until the pecans are darker in color and fragrant, about 8 minutes. Allow the pecans to cool to room temperature, then transfer to the work bowl of a food processor or blender. Add the honey and blend until very smooth, about 5 minutes. Add the mixture to the toasted oat flour. Return the skillet to the heat one last time and add the coconut. Cook, stirring constantly, until the coconut is golden brown and very fragrant, about 3 minutes. Reserve ¼ cup of the coconut for garnish. Add the remaining coconut to the oat and pecan mixture. Heat the chocolate over a double boiler until just melted and smooth. Add the melted chocolate to the work bowl of the stand mixer along with the coconut oil, cocoa powder, and vanilla bean. Using the whip attachment, beat the mixture until it cools to room temperature. Scoop the mixture into candy molds or paper candy cups and top each cup with the reserved coconut. Refrigerate for at least 3 hours before serving. Serve slightly chilled. What does this mean “¼ teaspoon fresh vanilla bean”? I know how to cut up a fresh vanilla bean, but not how to measure it out. 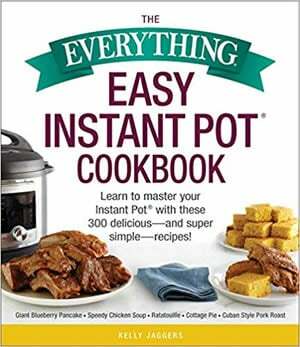 Thanks–the recipe looks fantastic. Terri – You need to scrape out the seeds from the vanilla bean and measure that way. Usually one bean yields about 1/4 teaspoon of bean. Alternately, you can buy vanilla bean paste, or even use a good quality extract in the same amount. Yes, yes, yes. Coconut, dark chocolate and pecans – you’re officially my “cheat day” friend.